I think it's a great documentation of one's trip to pick something available from your point of origin to your destination and then back and take photos of it. It is quite an eye opening revelation, particularly when you're traveling for a distance, of the differences in the US. I like to use gas prices and I've been doing this for years, decades, even. 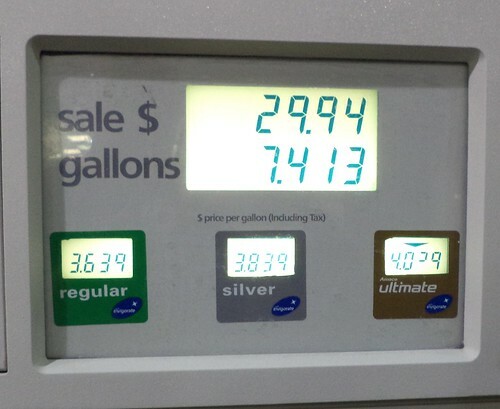 When I travel, I take a photo of the price of gas when I need to fill up. It's quite interesting. The Virginia trip would provide a great reflection of various areas of the country. I had my route all planned thanks to bing.com maps. It was, according to them, 860 miles one way. 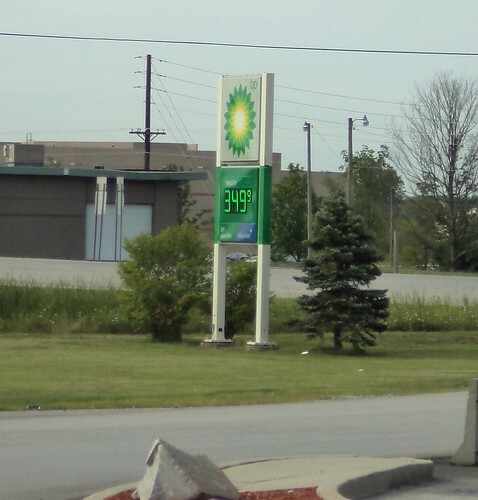 When I started saving for the trip, gas was $3.89 a gallon in Chicagoland and we had, if not the highest prices, close to them. I knew I was heading into an area where gas would be cheaper but I figured if I could save enough to fill my tank at Chicago prices, I would be very safe. I would need close to $350 to make it out and back. Okay. I'm ready. Let's go. I left on Thursday, August 15th with a half a tank of gas. I almost filled up but I felt I would be heading into an area of the country where gas would be cheaper so I decided to wait. I was in luck. 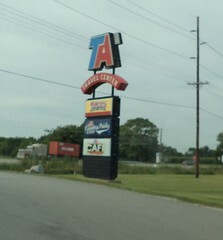 I stopped at a TA Travel Center outside Whitestown, Indiana. Gas was $3.49 per gallon. Now, one of the problems of this experiment is that I really should be documenting how many miles I put on the Jeep between fillings. Well, I didn't do that. I know I have a 16 gallon tank. The receipt tells me how many gallons I purchased. Instead of writing down the starting mileage, I just set the odometer to zero and took off, figuring I'd write down the mileage when I got to Carole's. I wrote down the mileage when I left Carole's and then didn't document it when I got home, instead taking a photo of the odometer reading. So, to ask me what kind of gas mileage I get per gallon is kind of a waste of your time unless you're really good with math. I am not. I just know what I spent over the course of the trip. 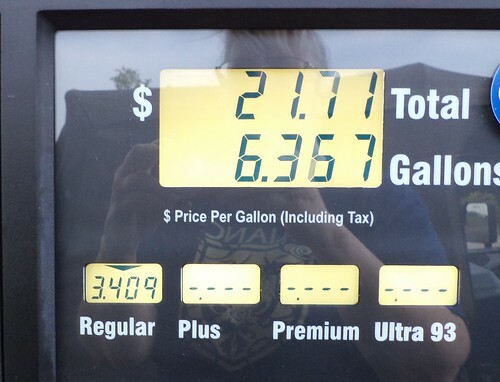 Here is our first fill up. I headed south on I-65 towards Indianapolis, Indiana. Gas was $3.77 when I left Chicago. I'll take an almost 30 cent per gallon difference. If you're keeping track, I spent $44.00 to fill the tank here. I traveled past Indianapolis and out of Indiana on I-70 towards Dayton, Ohio. It was as I approached Indianapolis that I realized I didn't have the road atlas with me. I had bing's printed directions but, as I've came to find out, they aren't the most up-to-date. While a road atlas can also be out of date, particularly if you are using one from 2006, if you intend to follow Interstate, that hasn't really changed beyond what may be under construction. I have one from 2012. It would have helped ease some of my fears that I had missed an exit. 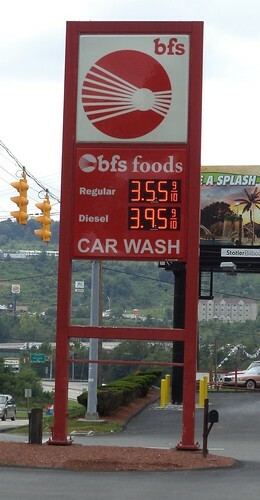 The next fill-up was in Gallipolis, Ohio. This was all the way across the state of Ohio, along the Ohio River border with West Virginia. It was hard to find the gas stations in Gallipolis. You have to get way off the Interstate and, if you are heading south on Highway 35, as the directions told me to go, you have to drive a mile toward the town center to get back on the highway. I got lost here because I missed a sign and drove north for a couple miles into the hills of southeast Ohio before turning around and finding the sign for east 35. I filled the tank for $45.60 here. So now I'm in the hills of West Virginia, heading east towards Virginia. There are these rocky outcroppings called the Appalachian Mountains standing between me and Richmond. I picked up Interstate 64 and then the West Virginia Turnpike and headed southeast and then back east toward Virginia. As dusk was settling across western Virginia, I stopped for gas and supper in Greenville. Be still my heart. That's a whopping fifty cent per gallon difference from home. That, right there, told me I had budgeted properly. $42.60 for a full tank of gas and I made it to Carole's with plenty to spare. I drove around Richmond, getting lost, as I said in a previous post, three times. I tend to write things down wrong, it seems, or I'm looking but miss my turn. But, when I left her house at 6:30 a.m. on Thursday, August 22nd, I had a bit over a half-tank of gas. I opted to go a different way home because some sections of the drive to Richmond were not to my liking. I knew that changing the route would add more miles and, probably, another gas stop, but I felt I could afford it. I headed back west on I-64. Instead of following it west into West Virginia, at Staunton, I turned right on I-81 and headed north. 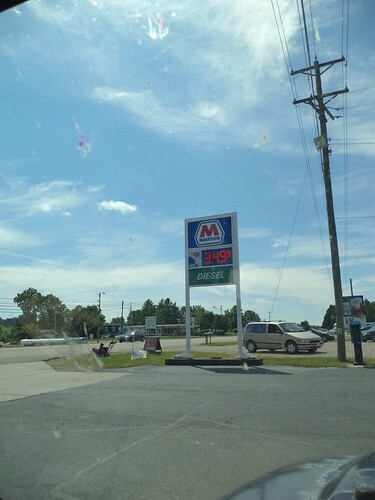 Outside of Staunton, I filled up for the first time. That's a whole penny difference in the tank of gas from south of Staunton to north Staunton. Thirteen cents is thirteen cents when every cent counts. This tank cost me $43.51. Back onto the road I went. This section of highway Carole and I traversed back in 2001 when we did our Civil War Battlefields tour. I recognized the signs for Antietam and Harper's Ferry. I took I-81 north until it met I-68 and then headed west. I had driven this section of highway back in 2011 when my mom and I came east for Carole's "Blessing of the Vows" ceremony with David Buckwalter. I did all the driving on that trip but the hills and road seemed different. We traveled in the afternoon so perhaps it was the sunlight. I got as far as Morgantown, West Virginia and stopped for lunch and gas. This price was a bit jarring. A full thirty cent difference between fill-ups. Mom and I had stopped in Morgantown on our journey back to Wheaton in 2011. I couldn't remember what gas was at that time. I didn't need as much gas here. It was more that I was hungry and felt filling the tank was a good idea, too. I spent $40.23 here. Interstate 68 disappeared and I hopped on Interstate 79 to go north. The next change of road numbers would be in northwestern Pennsylvania when I turned left and headed west on Interstate 80, a road I could probably drive in my sleep. In the meantime, I had to contend with road destruction. It's summer. In Chicagoland, that is cause to rip up the roads, sometimes with little warning. Signs said move left but didn't explain that the right lane exits the Interstate completely and you can't get back on because they are replacing this bridge. I wound up touring a 30 mile section of west center Pennsylvania for 45 minutes before the detour got me back on I-79 just 3 miles short of the intersection with I-80. I had to suppress some panic that, somehow, I had missed a turn for I-80 and was now heading straight for Erie. Once the sign for I-80 showed up, the panic disappeared. It was a straight shot home. I stopped at the Clyde, Ohio service center for gas. This was the most I spent because I drove to within 2 gallons of empty. I did have the thought that it would be like me to not have a car problem during the trip but to run out of gas in the middle of the Ohio Turnpike, 10 miles from the nearest exit. There is a distinct lack of signage on the turnpike to tell you just how far you are from something. But Ohio Turnpike travel plazas are very nice and the gas seems competitively priced. This fill-up cost me $45.75. Ohio is a fat state. It just seems to go on forever. "Are we there yet?" I could hear the child in me saying. I passed into Indiana as storm clouds loomed ahead. The rain was spotty. I had to stop and put up the windows because with the heavy rain came chilling winds. Traffic also picked up and I found myself, more than once, stuck behind a truck doing 55. Trucks still actually drive that!? When the distance signs started including Chicago on them, I knew I was close. It was still a 4 hour journey, but at least I could figure it out. I would be hitting the Interstates and toll roads around Chicago after rush hour but I had a slight nagging feeling I would be on fumes to actually get home. I best stop and top off the tank. As yes, $3.63 per gallon. I'm close to Chicago, that's for sure. I added $30 to the tank at Rolling Prairie on the Indiana Turnpike and headed home. Yes, there is a distinct preference in my gas stations. I know BP. I know their gas. There's one close to me. I do not have one of their reward cards. I don't think, after reading over the fine print, that it's worth it because I have quite a few options around my area. Yet, on the road, it's what I look for, them or a Shell or a Marathon. I may be deluded here, but I think gas from one main supplier is a more uniform quality than gas purchased by an independent. It probably doesn't make a difference. So, if you've been adding up the gas cost, I spent $291.69, total, on gas, far less than the $350 I budgeted. I needed that extra $30 at the end, but I have a half tank to start the week with. I'll take that. 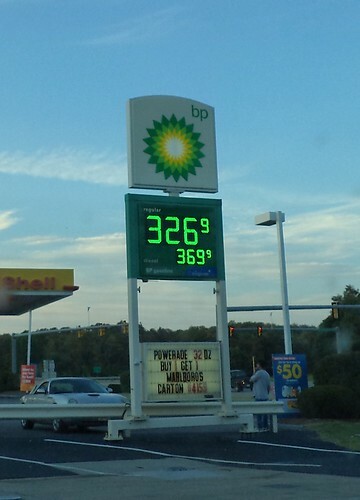 And gas was still $3.77 when I drove by the BP near the house. Hi Deb, Just dropped in from Sew Many Ways. I love cats and reading too and almost everything else you tell about yourself. Exept the W.of W.... not so much. 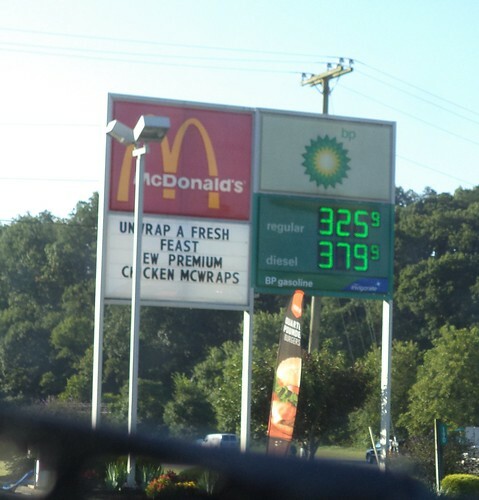 So, now you know why we laugh so hard at the fuelstations when we visit the US! And we tell everyone why, so they will feel a bit better too! Will drop by more often, you 'read' like fun!